I wonder if that is an e-collar or GPS. My dog will stick with me on the trail and absolutely loves humans, but if she meets another dog out on the trails I can't be 100% positive she won't engage in a bad way with another dog, especially a dominant one. Luckily where I do most of my riding it's rare to see another human or dog, but I wondered if a shock collar would help in this instance to remind her not to fight. Great video! 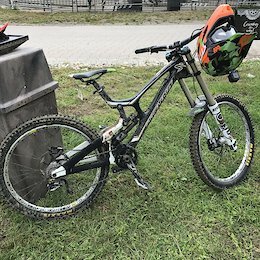 Posted in "2018 Kona Process 153 29r Upgrades?" 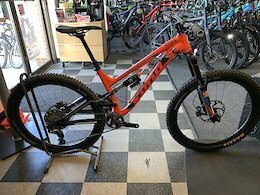 Posted in "Kona Process 111 Builds - Post 'em up!" Insightful piece Matt. I like to keep 2 wheelsets for every bike I own, esp. 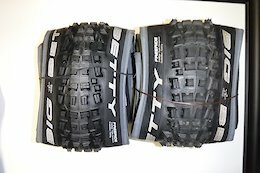 one carbon and one alloy for my main ride. But the other piece of the puzzle I think may be testing carbon vs. alloy bars, like Spank’s Vibrocore, to see how The System feels and performs. Posted in "Bottle cage on older Process"
Full disclosure, I’m copying “Comenwin’s” ad contents here. Mine is a used fork that came off a Salsa Bucksaw that I bought second-hand. Price includes shipping. 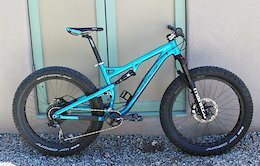 It is made for 27.5+ wheels but can accommodate a 4” fat tire. In some of the pics, you can see that the prior owner ground some material in the arch to accommodate 4” tires, less than an 1/8” if I had to guess. The steerer tube is 6.25” long. (1)Adjustments: Rebound, Air pressure, LS Compression, Incremental Platform Adjust, Hydraulic Bottom Out (2)Compression Damping: TPC Technology, MC2 Trail Tuned (3)Spring: Dorado Air (4)Bottom Out: Adjustable HBO, Rubber Bumper (5)Crown: Forged Deep Bore Hollow (6)Offset: 48mm (7)Rebound Damping: Adjustable TPC Cartridge (8)Leg Diameter: 34mm (9)Travel: 100mm (10)Leg Material : 7050 Butted Aluminum (11)Steerer : Tapered (12)Brake: Post Mount 180mm (13)Wheel size : 27.5" (14)Axle : QR 15 x 110mm (15)Crown to Axle : 527mm (16)Lock: Manual lock out system (17)Crown Colors: Black Crown with Black Fork (18)Weight: Around 2075g Hexlock tutorials: https://youtu.be/L72K0K6jllE https://youtu.be/14-4cFOR-PM Accept Paypal Shipping cost is included in the price- CONUSA only. Will Paul review it? Or maybe not...? Posted in "Bike Rack Recommendations (horizontal tray style)"